. Expected availability is late March or early April. Very cool! They are doing some really good things over there at Godox. Nice! It's li-ion too... Definitely a contender for me. This could be the explanation as to why there's been no TT685-P or V860II-P announcement. I am sooo happy they didn't go with unprotected cells. Hall doesn't seem to be aware of the fire/zapping hazards that loose unprotected cells might give ("18650" only means the physical dimensions of the cell, not its electronics characteristics; and not all 18650s are protected; it's not like AAs). Would've been a support nightmare if they hadn't put the cells in that cartridge. I'm also curious as to how they could have halved the recycle time but increased the battery life with a lower-voltage/lower-capacity battery pack, (V1: 7.2V 18.72Wh; V860II/V850II: 11.1V 22Wh) given that the AD600 Pro sped up recycle but reduced battery life. This seems counter-intuitive. Glad, also, to see they've finally incorporated slidelocks instead of those screwdown ones. And I really really hope that the scanning feature to autoset to the least-crowded radio channel, and improved radio master UI stuff gets inherited by the V860II and TT685 by firmware update, but am going to assume that will never happen (like my wish for TTL group ratios). Wish he'd spent some more time on what looks to be an LED modeling light (?) on the head. And whether or not the head swivel/tilt function has been improved over the V860II/TT685's use of heavy grease. Need elv at Flash Havoc to cover it to see what's really what. I have been waiting for a V860II-Pentax version, but this thing is better. I like so much the round shape. It has also zoom, modeling light (surely not too powerfull), it can work as a dedicated or slave flash, and works as a master if you need. This can simplify my usual configuration with a PTTL flash on camera + trigger on a bracket with a sync cable. Just one device on camera, period. Let's hope they develop a version for Pentax... and soon. I don't understand. Why is round better? Is it TTL? Does it do wireless? What does it do that others don't? Sorry, not criticising, just asking. I don't understand. Why is round better? The shape of the pattern matters in terms of how it will fill out a modifier (absence/price of hotspots), and what kind of falloff it has. But a round head looks like it gets closer to the larger/barebulb strobes in terms of falloff pattern and evenness of distribution. The shape of the tube can play a part, too, though, and it looks like the V1's tube is not going to be the same one in the AD200's round head, so what it will look like is still a bit of a puzzle. Is it TTL? Does it do wireless? It pretty much does everything the V860II does, except for "smart" optical capability. It will do TTL, HSS, has a built-in radio transceiver, and use a li-on battery pack. What does it do that others don't? Well, the main round-headed speedlight that this one probably is trying to ape is the Profoto A1. As it costs $1000, most folks don't go there, unless they need an on-camera speedlight to radio command their Profoto studio strobes. But it does have some function the Godox V1 won't have (e.g., TTL group ratio command), and its UI is really different. Also, Jinbei is also going to be making a round-headed speedlight for their system, which is comparable to Godox is many ways (but so far, their TR-Q system does not support Pentax, only Canon, Nikon, Sony, Fuji, and MFT). Adorama rebrands Jinbei as "Orlit RT" gear. recycles twice as fast (~1s for full power recycle, vs. ~2s for the V860II or TT685). runs off a li-on battery pack, like the V850II/V860II, with roughly 3x the capacity of a set of 4xAA; the V1 pack is not compatible with V850II/V860II. tilts 180º, not just 90º (I.e., you can point the head directly behind you without swiveling). has an LED AF assist, (possible video light? ), probably better for mirrorless AF assist. Directly takes the round magnetic modifiers also used on the AD200's round head accessory (i.e., you don't need Magmods's giant rubber band). Can automatically set the channel to the least-crowded radio frequency (scans all the available channels). Has a better UI for radio control of off-camera flashes, if you use the speedlight as your transmitter unit. He's guesstimating the MSRP to be around $250, but he's not really basing it off anything other the base price of the V860II being $180. Last edited by inkista; 03-01-2019 at 05:52 PM. However, the video says it only "tilts a little bit back", not the full 180º. It looked like he was able to flip it both ways, but you could be right. The shape of the pattern matters in terms of how it will fill out a modifier (absence/price of hotspots), and what kind of falloff it has. I don't get the craze about round heads. I think if Profoto hadn't released the A1, there wouldn't be so much craving and copying. For use in light modifiers bare bulbs (like that of the AD200) are best. For use as an on-camera flash, a rectangular shape is best (to match the frame of the camera). Round illumination patterns can be useful to create patterns on backgrounds, but that's a rather limited use case. AFAIC, one of the best aspects of a round head speedlight is that one can easily rotate a flag (like the BFT). Yes, it's a rectangular zoom head moving inside the round barrel. I cannot see this working optimally as it's like fitting a rectangle through a round hole. The head probably features a diffusion disc that acts as a rectangle->round converter but I'm sceptical that the rectangular source will not ever show (e.g. at each zoom setting). It's only about in the range of ~125º-135º degrees. Well, it's going to be too weak to act as a real modelling light apart from certain special situations and in the latter it will matter that the light comes from a different place in the head. Hence, the shadows produced by the modelling light will only approximate what the real tube will produce. I'm not knocking the availability of a constant light source but I find it a stretch to call it a "modelling light" when it is not aligned with the tube and is too weak to support any standard modelling light applications. Overall the V1 could still be a really useful speedlight but I just don't get the excitement about round heads. I find the AD200 to be a much more compelling product, but then I'm not an on-camera flash user. Not sure about anyone else but, for me, this reminds me of the AD200's round head. They say in the video that is uses the same accessories the AD200 round head uses. You can use the barn door to square up the light if needed. I'll look for it again but I saw a video reviewing the AD200 round head. Compared to the other heads, the round head was much softer with no light modifiers. Not sure about how this affects anything inside a softbox if it does at all. My assumption would be a square light would fill softboxes more evenly if there's any discernible difference but, I'd have to see some testing. I'm not specifically excited about this flash. I'm excited that Godox is expanding their brand. With their system, anything they make that works with the system is usable by Pentax cameras. The more they create and offer, the more I have at my disposal. Also, it sounds like they are really listening to the user base and adapting their products as best they can. I know most companies do the same but, for some reason, I feel like Godox gets that right in the offerings they release. Well, "much softer" is physically impossible because the softness of light depends on the apparent size of the source, not the shape of the source. Not sure about how this affects anything inside a softbox if it does at all. It's going to be a better fit for umbrellas, but most light modifiers benefit from a true bare bulb characteristic and the Profoto-style diffusion disc approach is not optimal. This is particularly true for parabolic light modifiers but also for most others as they pretty much all benefit from an optimal fill factor. My assumption would be a square light would fill softboxes more evenly if there's any discernible difference but, I'd have to see some testing. I agree that forward-firing designs with a rectangular baffle would work better with a regular speedlight while forward-firing designs with a round(ish) baffle will benefit from round-head designs. I'm not specifically excited about this flash. I'm excited that Godox is expanding their brand. As I said, I don't dislike the roundhead speedlight; it could be very useful for a number of purposes and the Godox model has some nice perks. I guess I just want to understand what makes people so excited about the round head. They're calling it "Flashpoint Zoom Li-ion X R2 TTL On-Camera Round Flash Speedlight." But I forgot that the GN usually is measured with the zoom at maximum. So I did a quick measure of my Metz 48 & V850 at 50mm, and I got f29 & f25 at ISO 100, 1m. So the V1 has roughly the same GN as the Godox fresnel type V850 speedlights, which is a very good news. Another reference, comparing the AD200 with barebulb and 28mm standard bowl, v850 at 28mm, Metz 48 at 28mm, I measured f45 - f22 - f20. Well, this is just theoretical comparisons, let's wait for Robert to measure the real V1 power. About preferring or not the round heads on fresnel type: I understand that, just using the flash on camera and pointing forward, you should not notice obvious differences, maybe the light from the round type can be a bit softer because the head is bigger (maybe 1.5 times bigger ?). But then you have a second use of this speedlight on camera: bouncing light. I see that here the round one could have an advantage. Fresnel heads project a rectangular or rather ellipse-like pattern, and the round heads project a circular or near circular pattern. Well, my point is that this projection will be bigger with a round head, so It'll create a bigger 'virtual' source of light on the wall and so I'll get softer light for my subject. This is comparing the V1 with a V850/V860 at the same settings of power and zoom. I can't know if this difference will be noticeable. And I'm supposing that the projection will be bigger for the V1, it might not be the case. 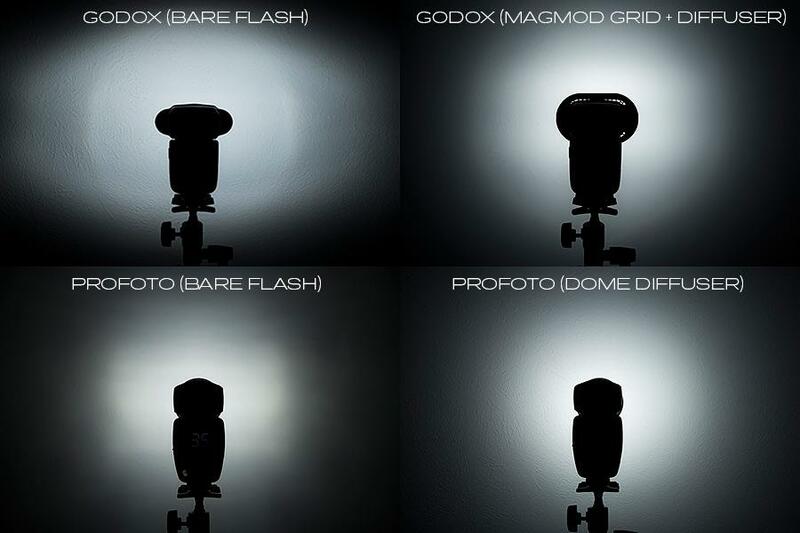 * can be a Master, and it seems quick and easy to control up to three remote Godox flashes. The only point that would make me buy this speedlight. * Godox will develop a Pentax version... I hope so. If not, I'm not going to buy. No Pentax version apparently, only Canon / Fujifilm / Nikon / Panasonic / Sony.